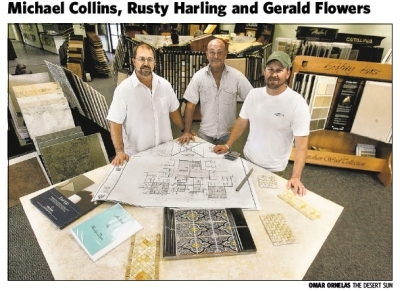 The Works Floor and Wall owners (from left) Michael Collins, Gerald Flowers and Rusty Harling have moved their business to a new, bigger location in Palm Springs with the help of a $322,000 loan, awarded through the SmallBusiness Administration’s Recovery Act program. The Works Floor & Wall are true Specialists. Everyone here, from helpful sales assistants to the expert in-house installers are ready to help you with your project. Why do we call ourselves The Works Floor & Wall? The WORKS; by definition means everything, all the bells and whistles and all the extras. What is “everything”? It means that we deliver a complete job, from conception to completion, providing the best value, quality, customer service and experience, in essence the best of everything…every time. Come see our showroom! Visit us at our exclusive Showroom Design Center. We have thousands of flooring samples, window coverings, countertops and more. We also have a wide variety of stone, porcelain, wood and carpet. We are a convenient drive from anywhere in the Coachella Valley. We’ll beat any competitive price you find! Have a specific question? Learn about the flooring products we sell and the services we offer. Ready to have us quote your next project? Contact us today and be sure to see what our clients are saying about us. Coachella Valley and most of Southern California. "Rubik's™ Cube ® used by permission of Seven Towns Ltd"